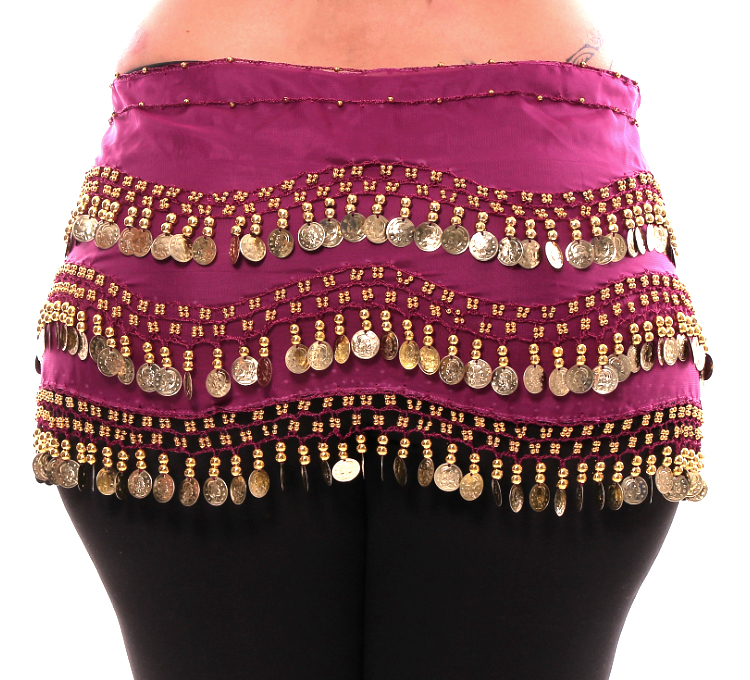 Shimmy in style with this high quality, imported hip scarf made especially for "Goddess Size" belly dancers. Shimmy in style with this high quality, imported fuchsia hip scarf made especially for "Goddess Size" belly dancers. You won't just look good, you'll sound good too! Great for any style of Belly Dance, Zumba fitness class, and more. Chiffon base with intricate beadwork and gold coins sewn on in a wave pattern. XL/1X-4X: Total width (end to end)- 86 inches; Decorated area- 45 inches; Length (NOT including coins) 9 - 10 inches. Reasonably happy with the sizing for the plus size hip scarf. Well made. The pink of this scarf is just like the picture, it's very rich and bright, which I absolutely love. It has a little weight to it which you want with all of the coins, and they're sewn beautifully and appear very sturdy. So far every time I wear this I get compliments and the color really brings out all of my shades of pink and makes purple look great too! After ordering my hip scarf it arrived very quickly in the mail. It is pretty although there are more expensive and better quality hip scarf on the market,but this one is perfect for what i want and need. Q: Hi, where do you ship from? A: Hi Nicole, Thank you for your question. We ship from Glendale, California. I hope this helps. Have a wonderful day.